The classic Godiva Gold Box has been freshened up for Spring with a bright and beautiful pink ribbon, tied in the perfect bow. 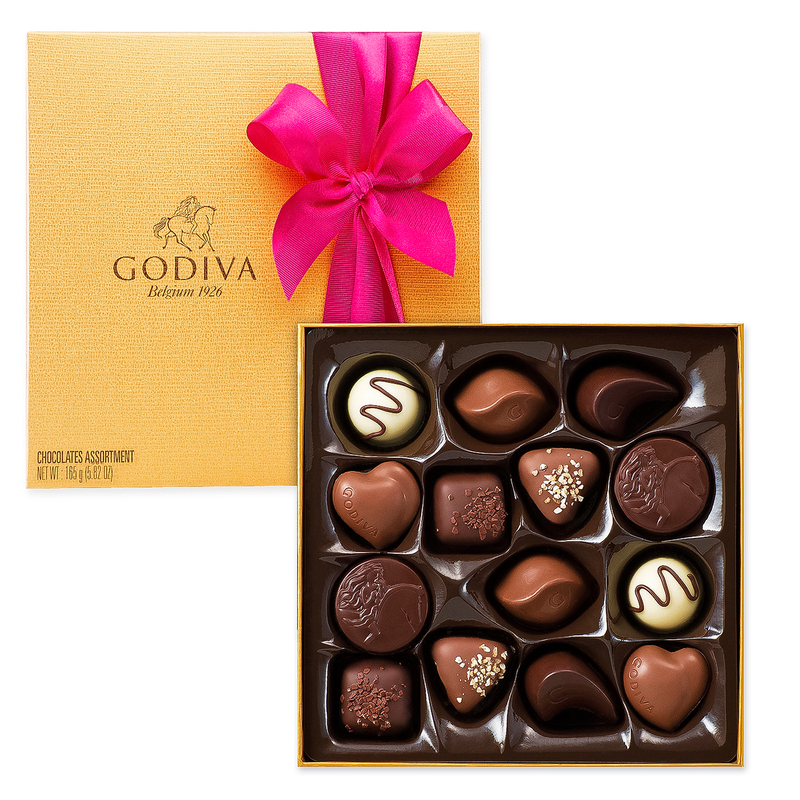 Of course, if you’re familiar with our ballotins you’ll know that the very best selection of Godiva Belgian chocolates waits beneath the shimmering gold packaging, including milk, white and dark chocolate creations with smooth creams, soft ganaches and nutty praline fillings. Ingredients: sugar, cocoa mass, full cream milk powder, cocoa butter, hazelnut, glucose syrup, CREAM, almonds, butter, vegetable oil (palm, palm kernel, sunflower), sweetened condensed milk, invert sugar syrup, humectant (sorbitol), skimmed milk powder, milk, butter oil, full cream milk, hydrogenated vegetable oil (palm kernel), wheat flour, emulsifier (soy lecithin), flavourings, passion fruit juice concentrate, coffee, honey, maltodextrin, salt, cocoa powder, milk sugar, milk protein, barley malt flour, acidity regulator (citric acid), natural vanilla.